Nearly every attempt at success is met with failures along the way, and properly managing those failures can actually benefit the Innovation process. As an Innovation leader, do you celebrate failure and risk-taking in your organization? Doing so will broaden horizons and lead to more valuable ideas towards a culture of sustainable Innovation. Innovation = Creativity x Risk-taking. And more likely than not, the bigger the innovation means the greater the chance of failure. In the pharmaceutical industry, 1 out of 1000 is considered a great success ratio. In the grocery business, the success rate for new product entries is 1 to 100.. Risk-taking will no doubt require failure management. In order to “manage failure,” an Innovation leader needs to define the risk and bandwidth that is OK to team members. Then if we fail, we make it a learning experience and praise people for it. 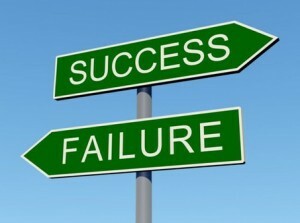 Failure management means never allowing an unsuccessful risk to hamper a team member’s opportunities and advancement. Let your people feel safe to fail, but empower them to do their best work. After all, failure is not what team members should be thinking about during the New Product Development process. Fear of failure can kill Innovation. Especially in a difficult economy where job security is in question, employees want to play it safe and are hesitant to take risks. In this type of environment the most important thing is to establish trust – so team members are willing to take the risks necessary to act, decide and move forward on the path to Innovation. An Innovation champion doesn’t just award successful ideas, but encourages a tolerance for failure and enthusiasm for risk-taking. Without risk, there can be no Innovation. Here are a few tips for encouraging your team members. 1. Profiles in risk. Clearly communicate the risk profile you are asking your people to adopt and state why it is important to the organization’s success. 2. Key learnings process. Establish a formalized, non-accusatory process for harvesting key learnings from unsuccessful risks. Distribute these lessons learned. 3. Tools of the trade. Give your people the tools they need to help them improve their risk-taking decisions.